For the past month I’ve been reviewing citations – correcting them and making sure they are consistent. As I reviewed the citations for passenger manifests I realized how much had changed since I started researching 40 years ago. Today it takes a few seconds to find my grandmother, Annie Shanley, on a passenger manifest in Ancestry. Before the internet it was more complicated. I was lucky, I had a reliable family story. My grandmother told her children about her trip and my mother told me. Grandma arrived in New York on the day McKinley was shot, or maybe the day he died. When she got off the ferry in Battery Park with her mother the bands were playing. She thought they were to welcome the immigrants, but they were playing for the President. President McKinley was shot in Buffalo on September 6, 1901 and died on September 14, 1901. Fortunately, the records for 1901 were indexed. I would need to order the correct microfilm roll from the Family History Library or through my local library. After finding the ship and the date I would then need to order another film. This could take weeks. There was another way, request NARA check the records; for a small fee they would copy the record. I did that, putting the date McKinley was shot, September 6, 1901, and sent the form to NARA in June 1977. I got the results fast – they couldn’t find it!! How was this possible? I have 20-20 vision, borrowed a magnifying glass, had four people there trying to decipher the 2 cards (2 x 3 each)…NO WAY could any of us come up with anything. A trip to Washington D.C. It would take a trip to NARA in Washington D.C. in June of 1981 to find Grandma on a ship’s manifest. The original index had been done on 2 x 3 cards, one for each passenger with information on name, age, former residence, ship, date of arrival, and a few other details. These cards had been microfilmed and the section I needed had been damaged, the names were gone, but a few bits of information peeked through. Two important pieces of information survived: former residence and ship information. I slowly went through that roll of microfilm and was rewarded with “ROSS” – former residence and the date of arrival. Next I had to pull Microfilm roll # 222 for September 11, 1901. I didn’t have to look long. There she was: Annie Shanley, age 19, arriving on the S.S. Oceanic with $4.00, meeting her mother who had paid for her ticket. I ordered a copy – the old readers at NARA did not have printers – and I still have it. It’s about 18″ x 24″. Flash forward to the internet age and I was able to find out more about Grandma’s arrival. The bands were playing to celebrate the expected recovery of the President. A few days later sepsis set in and he died on September 14. The Oceanic was a big ship and I found several articles about her and about my grandmother’s trip. 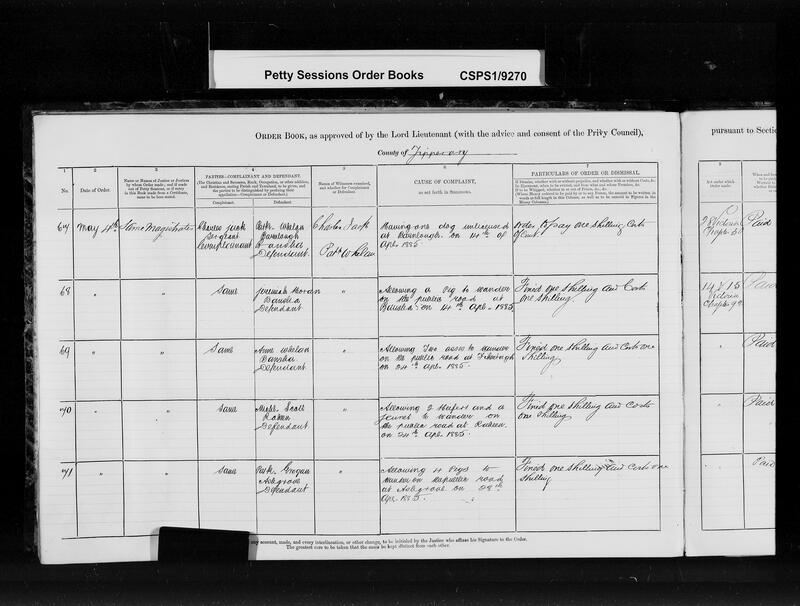 Back to citations, working on census records now. About halfway through citations, started gathering photographs, maps, illustrations. The Aherns and their dogs. 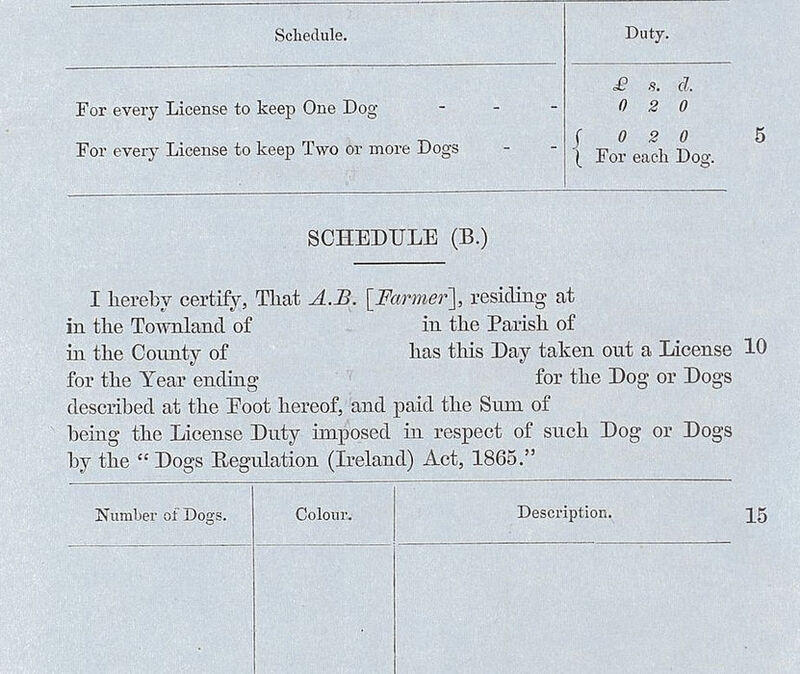 Starting in 1866 the Irish had to register their dogs. Click on picture to see the law. By March 31st of every year the owners had to go to the local petty sessions court to register their dogs. 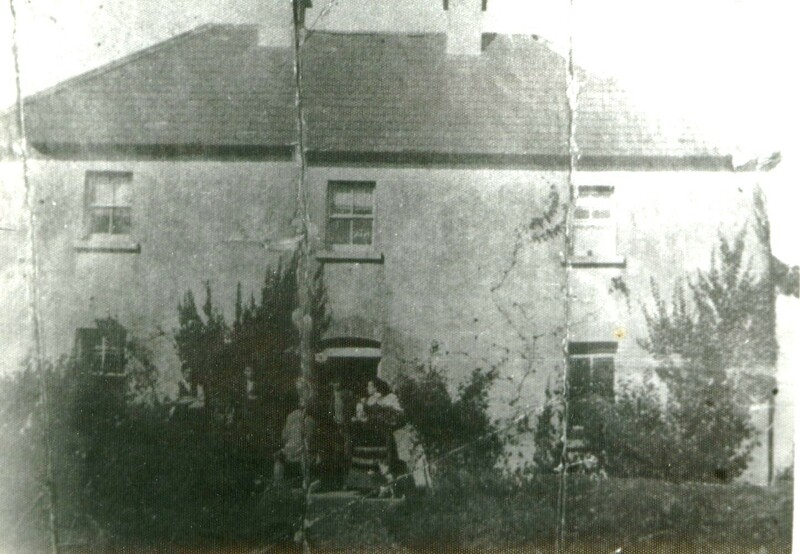 For the Aherns that would have been in Oldcastle. 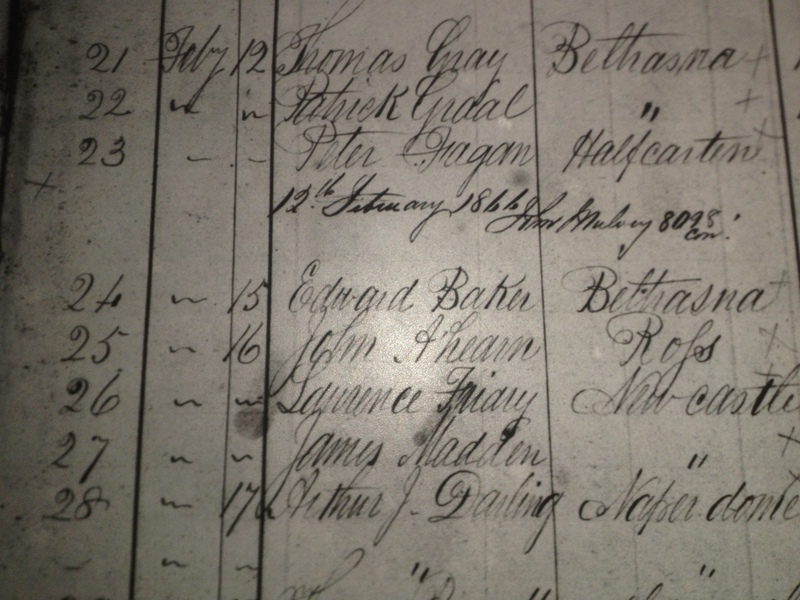 In 1866, the first year of the law, John Ahern went to Oldcastle in February to register his black mastiff. Within a few years, most people were waiting until March to register the dogs. The real rush came the last few days with several hundred people lining up to make the deadline. In 1866, my great great grandfather, John Ahearn, was one of the first to register a dog, a black mastiff. In future years, most people waited until the end of March to register their dogs. John Ahern registered a black mastiff. 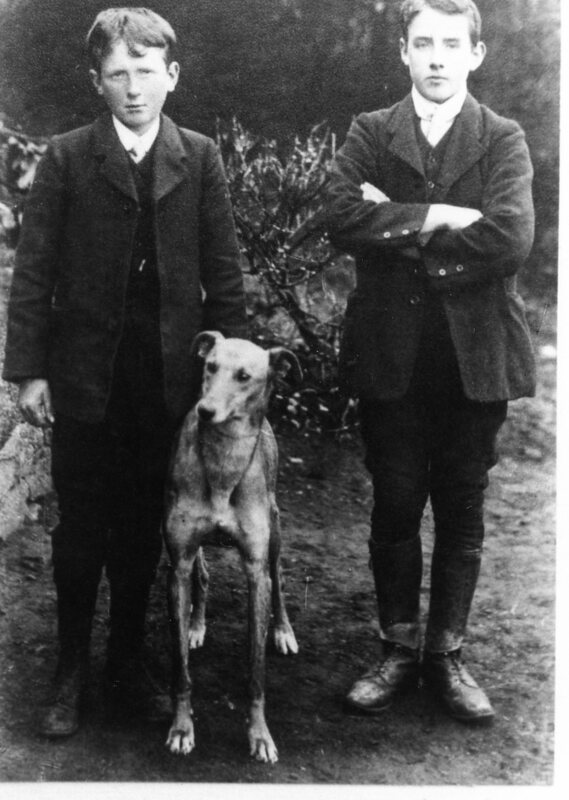 My great grandmother, Margaret Shanley had a collie in 1912. 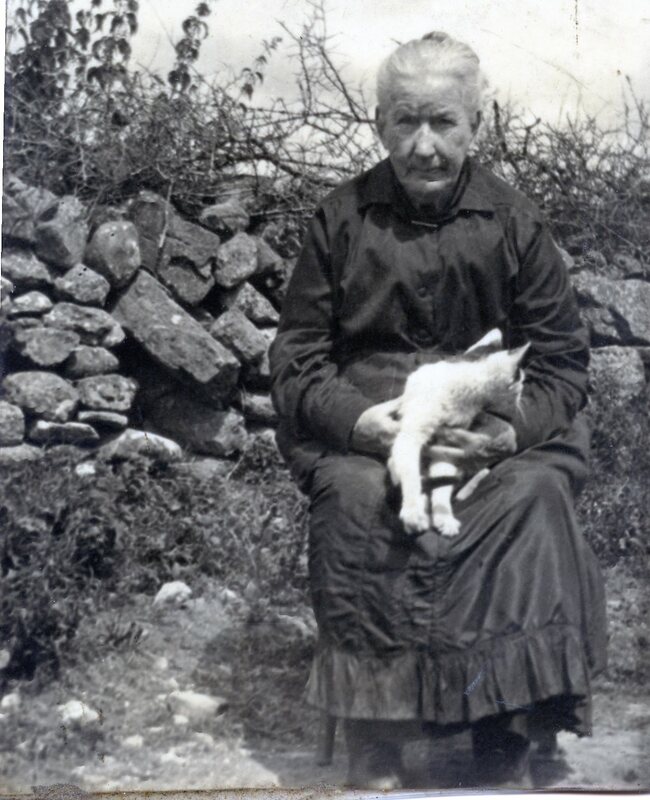 In this 1920s picture she’s holding a cat, but Margaret Shanley owned a collie for a few years. 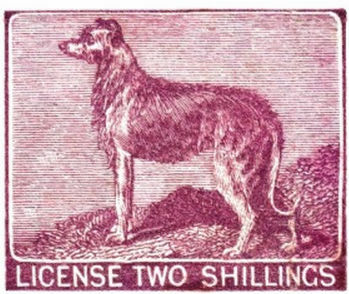 Stamp that was affixed to the dog license. Different colors were used throughout the years. This would have been given to the owner of the dog. Patrick Whelan, who may have been my grandfather’s uncle, was fined because his dog was unlicensed. Note Anne Whelan who was fined for letting two asses run free. She may have been my great grandmother. If you didn’t register the dog you were subject to fines.